Font size em, No decimal value allowed? 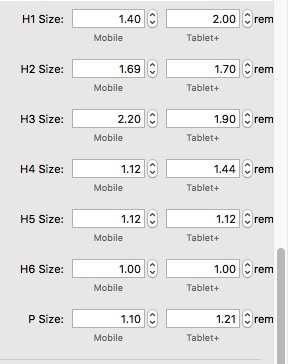 I’d like to use em values for font-sizes, but it seems you can only choose whole number (1, 2, 3, etc). It’s not supported yet, you are right it’s important and it’s coming very soon. I’ve been used to using Rem in the past with Foundation and I’m not entirely sure whether Rem or Em is the best solution, but precise control over text sizing is clearly something we all want. This is coming today, just finished it off. Blocs 2.3.1 beta will have decimal point support for EM. Shouldn’t that be 2.4 beta1? I take it there will be a few point updates before we head towards 2.4. Yes 2.4 won’t drop until late Feb/march. I’ll run the patch updates in beta for a few days before pushing them public, they will be pretty solid. I could hold off and only include all new features in 2.4 but this was supposed to come in 2.3 it just wasn’t complete in time. It will be good to see this in 2.3 rather than wait for a month or two. The em implementation in 2.3.1 seems strange. I can set the size in the side panel as 1.3em for example, but it immediately reverts to show the size as px. Meanwhile in the project settings, the em settings are limited to single point 1,2 or 3 em for example. I thought we were headed towards something like the screenshot that applies sizing site wide and remains on the chosen measurement system. Sorry I should have been more clear, em and rem are only available via the class editor in this first beta, project settings will be switched on in build 2, I’ll also look at the sidebar options too. Thanks for the clarification. This will be a great addition when everything is finalised.